Ksar Lemsa is perhaps my favourite Byzantine remain of Tunisia. The fortress here is so well-preserved that you can see how the typical top of the towers looked like. Gun slits are visible all the way tot the top. 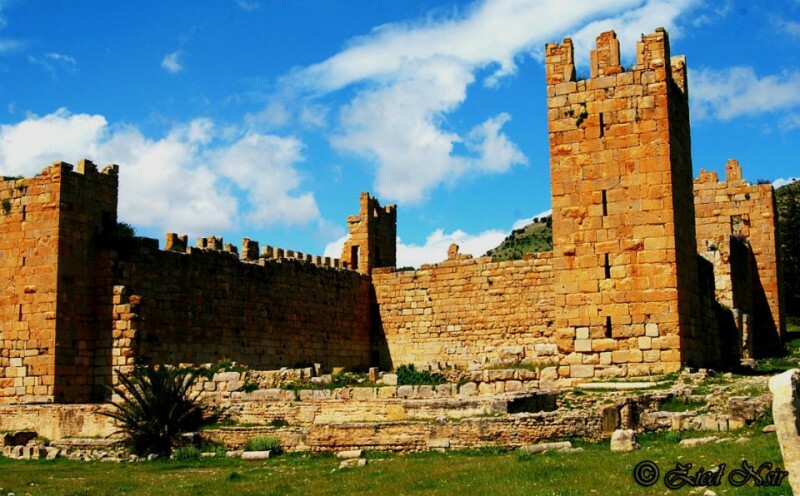 The fortress stood right in the middle of an regionally important town dating back to Roman times. The town controlled trade routes between the south and the north. I have no record of the town's name, Ksar is all Arabic, meaning fortress, but "Lemsa" may be originating from an ancient name. The fortress dates back to the 6th century, but employed stones from preceding buildings. Three of its walls are almost completely intact, while only the northeastern tower is equally well-preserved. Take a look at some of the stones in front of the eastern wall (the worst), they suggest more about the functions of the ancient town than the areas around the fortress where the town was. The fortress is 29 metres by 31 metres, towers about 12 metres high. Walls were about 7 metres high. Entrance was to the north (second photo). There are some modest remains of an amphitheatre on the other side of the road. Practicalities Ksar Lemsa lies in an area without hotels or set-menu restaurants. The nearest are in Siliana 50 km west. Other options are actually as far away as Dougga 100 km northwest or Kairouan 75 km southeast. Getting out here involves arranging your own transport. If you start from one of the places above, get public transport to Bargou or Siliana, from there you hire a taxi for the ride. Make sure that this trip include Siressi (Oum el Abouab) 20 km north. If you drive, head for Ouesslatia from the south, Bargou from northwest or Oum el Abouab northeast, then ask for directions, people will know. Roads are good.